See, I told you I wasn't done with apple recipes! I sure hope you still have some of that amazing salted caramel laying around just waiting to be used. Yes? Great! Since I had some caramel sauce in the fridge, I thought it was high time to make some ice cream with it. 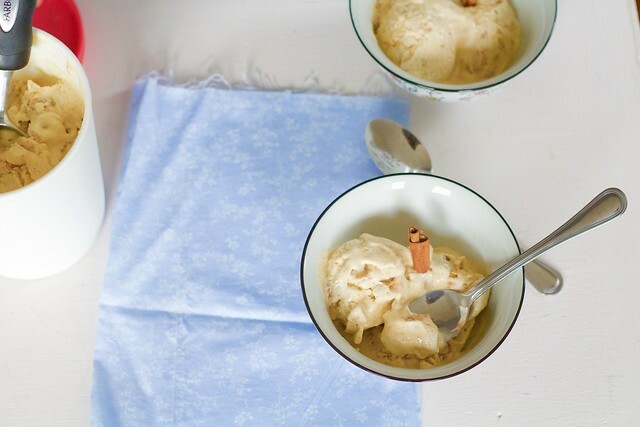 Just because it's getting colder out, doesn't mean we can stop eating ice cream, right? I eat ice cream year-round and I like it. After making the ah-mazing salted caramel apple pie, I had the brilliant idea (if I say so myself) to make an ice cream version. Why not!? This ice cream is definitely worth the time. It is sooo good. I used my favorite ice cream base, then I sautéed apples to soften them and add wonderful flavor, then for the crust-like flavor, I added crushed graham crackers. And of course, we can't forget about the salted caramel! I swirled that in after making the ice cream. Creamy, sweet and salty, and just dang delicious. To make the ice cream, whisk together the cornstarch and 2 tablespoons of the milk in a small bowl to create a slurry. In a medium saucepan, combine the remaining milk, heavy cream, sugar and corn syrup. Scrape the vanilla bean seeds into the pot and as well as the vanilla bean and the cinnamon stick. Bring to a rolling boil over medium-high heat, stirring occasionally. Let boil for 4 minutes, stirring occasionally. Remove from the heat and whisk in the cornstarch mixture. Place the saucepan back over the heat and bring to a boil again over medium-high heat. Stir constantly with a heatproof spatula until slightly thickened, about 1 minute. Whisk the hot milk mixture into the cream cheese mixture until smooth. Cover and place in the refrigerator until completely cool, several hours or overnight. Meanwhile, prepare the apples. Melt the butter in a medium saucepan over medium heat. Stir in the apples, honey, cinnamon and vanilla extract. Cook, stirring occasionally until the apples are soft and golden brown. 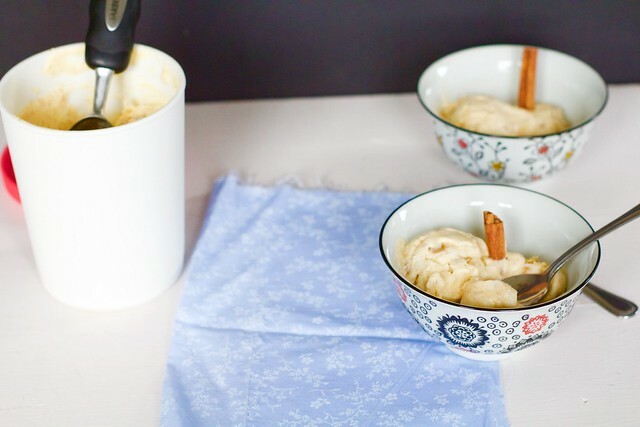 When the ice cream batter is chilled and ready to churn, remove the vanilla bean pod and cinnamon stick. Freeze in an ice cream maker according to your manufacturer's instructions. Scoop half of the ice cream into a container, then fold in half of the apples, graham cracker crumbs and caramel sauce. Scoop the rest of the ice cream into the container and fold in the remaining ingredients. Place in the freezer or serve.